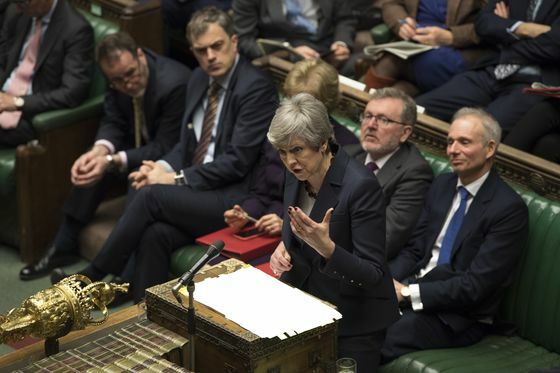 (Bloomberg) -- The U.K. staggered through another day of Brexit drama in which Theresa May promised to resign if Parliament backed her deal, but ended it no closer to agreeing to a plan for leaving the European Union. Members of Parliament voted on Wednesday on eight possible options for a new Brexit strategy -- including one modeled on Norway’s relations to the EU and another proposing a new referendum -- but rejected every one of them. The government immediately declared that this was proof that May’s deal, which has been rejected overwhelmingly twice in House of Commons votes, was still the only one in play. Yet that, too, seemed to be doomed. The pound fell. The fresh parliamentary convulsions followed May’s announcement to a highly charged meeting of her Conservative Party that she would make way for a new leader, if only her colleagues dropped their opposition to her Brexit deal and voted it through. May’s desperate gamble seemed at first to be working, as several pro-Brexit Tories -- including Boris Johnson and Iain Duncan Smith -- told colleagues they would support her divorce agreement, according to people familiar with the matter. But the Democratic Unionist Party, the small Northern Ireland group that props up May’s minority government, issued a statement saying it will oppose the deal if it’s put to another vote in Parliament. It’s almost impossible for May to get it through without them. Even if her deal fails, she’s promised her colleagues she will resign. “I am prepared to leave this job earlier than I intended in order to do what is right for our country and our party,” May told a packed meeting of Conservative MPs inside one of Parliament’s oak-paneled rooms. According to people in the room, an emotional May made her pledge in an attempt to persuade Tories to vote for her agreement before it’s too late. The EU has set Britain a deadline of Friday to ratify the divorce agreement, so the country can then leave the bloc on the later-than-planned date of May 22. A no-deal Brexit threatens the kind of economic crash that would hit the pound, disrupt goods supplies and provoke a major slump in house prices, according to official analysis. May’s divorce agreement has been rejected twice in parliamentary votes — but there is little support for leaving without a deal. After Parliament seized control of proceedings from the government in order to hold a series of votes on different Brexit Plan B models, the result was one that many had predicted: the politicians rejected all options. The closest any of them came to winning a majority was a proposal to keep the U.K. in a customs union with the EU, which lost 272 votes to 264. A plan to submit any Brexit deal to a confirmatory referendum secured the most support -- 268 MPs voted for it. But it was still defeated. Both of these proposals secured more support than the 242 lawmakers who voted for May’s deal the last time around. May must now decide whether she will put her deal to another vote, potentially later this week. And if not, the House of Commons is slated to hold another round of voting on Plan B options, to narrow the choices down further.